Okay, usually I post about all my workouts and how great they’ve felt, how wonderful I feel to have them done, yadda yadda. Last night, I skipped my workout. I was sooo tired in the afternoon, that once I got home from work, I laid on the couch and napped for almost an hour. I am not normally a nap-taker, so maybe I needed the extra rest? I feel like my long run on Sunday has thrown me all off-schedule. Then Matt and I went out to dinner for Mexican food, and you KNOW there was no running happening after that. And then my alarm went off, and I hit snooze, and went back to sleep. And then come home to run. How do you keep yourself motivated, especially when you’re tired and busy during the week? What do you do to get out of a slump? Well my [rather unhealthy] eats post last week seemed to be pretty popular, so here are more pictures of my eats this week. Some healthy…some not so much. Caramelized bacon & chocolate chip pancakes. Ohhh, that perfect combo of salty & sweet! With bacon and eggs on the side. Oh yeah, and rounded out with a Horny Goat HornyCopia Pumpkin Ale. 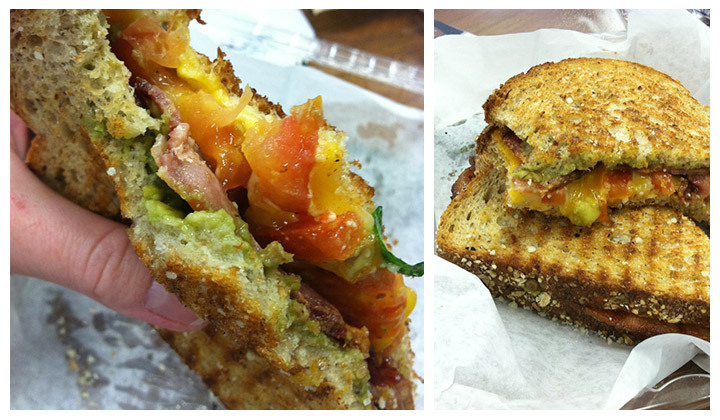 The best sandwich I ate all week: Bacon, tomato, guacamole & colby jack cheese on whole grain bread. Must recreate for dinner. 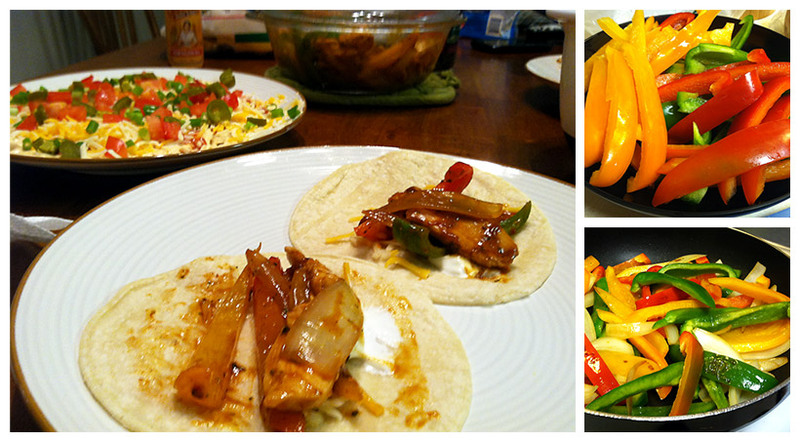 Mexican fiesta dinner night: Chicken fajitas! At least I can feel good about all those veggies. But then there’s that taco dip. Another healthy “not so much.” But I looove taco dip. Ole! 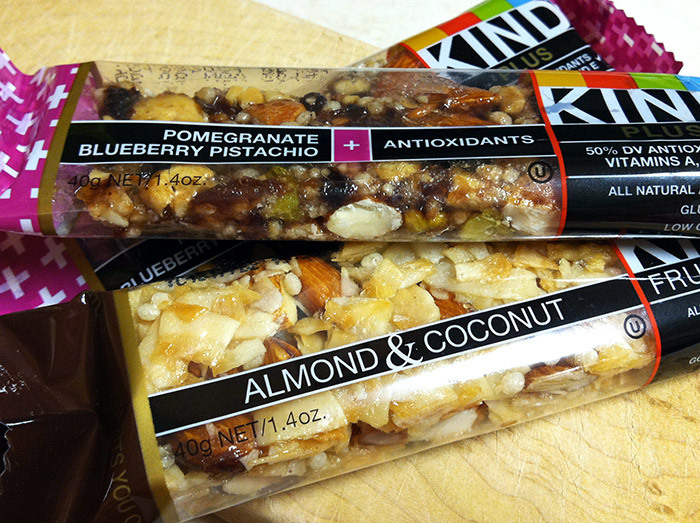 Kind fruit & nut bars. These are so yummy. Healthy, wholesome & delish afternoon snack that actually keeps me full. 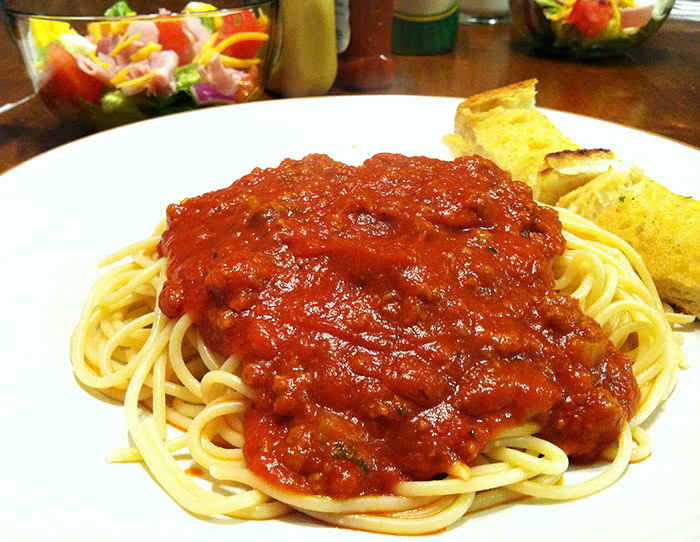 Matt’s spaghetti & homemade meat sauce. Love when he cooks me dinner! There you go, top eats of the week. 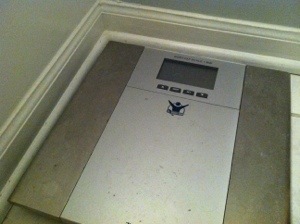 Good thing I started running again…? What good stuff did you eat this week? 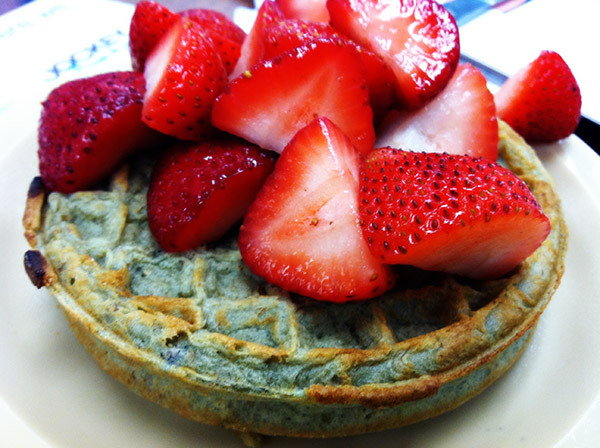 Here’s a glimpse at my week so far… As told by pictures of indulgent foods. Feast your eyes. Take-out Italian for dinner Monday night. 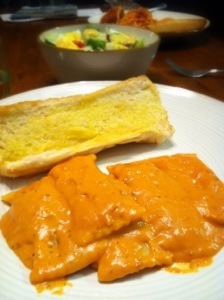 Stuffed rigatoni with tomato vodka cream sauce. After a looong day, comfort food was splendid. A glass of wine was splendid too. 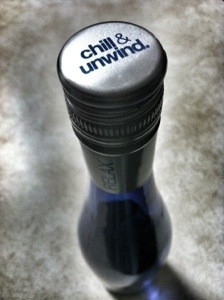 Relax & unwind. Got home from work tonight & Matt got me cupcakes. “Just because.” He knows the way to my heart. 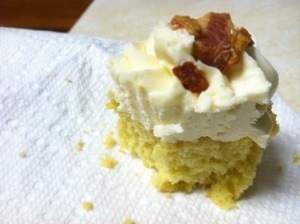 😉 This one was ‘bacon & pancakes’ flavor, deeelish! But not now. Now, we’re going out to dinner & to see Ender’s Game. Have a great night, folks! 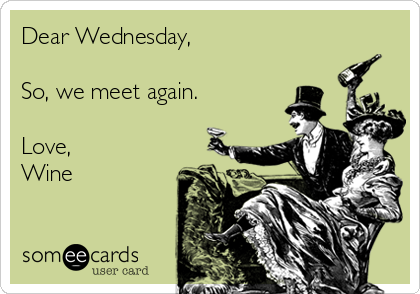 How’s your week so far? What’s your fave cupcake flavor? Seen a good movie lately? Let’s take a break from all the running and injury chatter to look at lovely pictures of something we can all enjoy…FOOD! 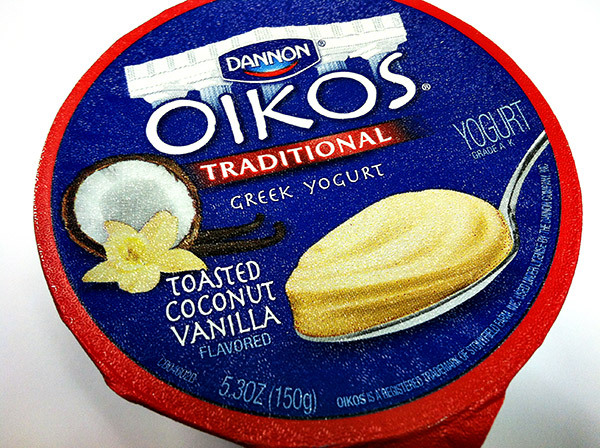 I try to steer clear of sugary yogurts, and also stick to the 0% fat, but I finally caved and tried the Dannon Greek Coconut Vanilla flavor. OMG. I wish I had tried it sooner. It’s rich, creamy, coconutty, and tastes quite decadent. Each single size container (~5 oz.) has 160 calories, but you get 11 grams of protein with that. I’ve mentioned how much I like Luna Bars in my last eats post, and I’ve found a second favorite. This flavor is a delicious mix of sweet and salty. 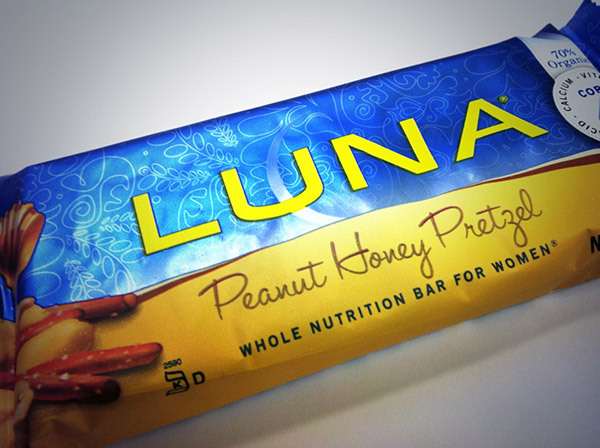 The Peanut Honey Pretzel Luna bar is super yummy, doesn’t taste ‘fake’ like some health bars can, and doesn’t upset my stomach if I eat it right before a post-work run. I love cheese! I do live in Wisconsin, after all. I try to limit my cheese eating because of all the fat in it, but this is a cheesy snack that will still help you stay light on the scale. 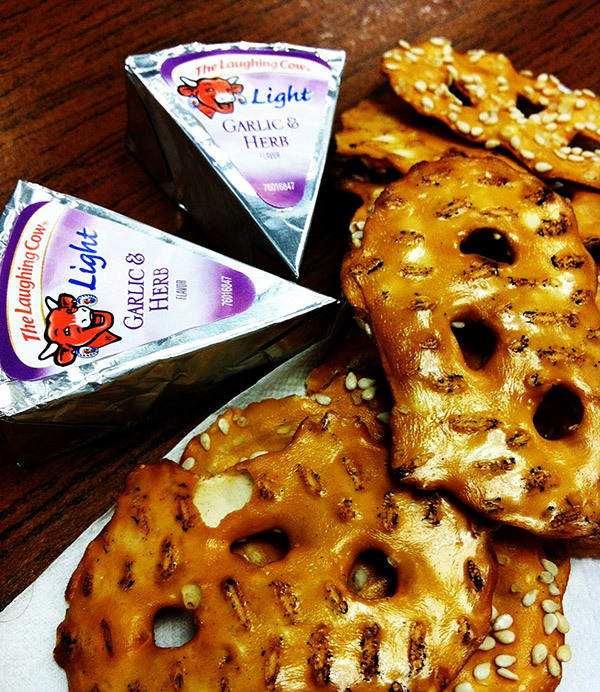 Pair some creamy Laughing Cow light cheese wedges with crunchy Pretzel Crisps for an easy snack at your work desk. Have you ever noticed how vibrant red tomatoes are from your own garden, or fresh picked at the farmer’s market? I got a couple giant, rich red juicy tomatoes last week and had to find a good use for them before they shriveled up like the end of summer. 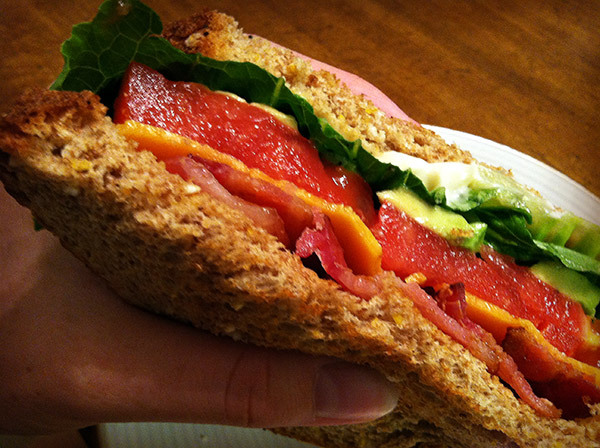 Enter this BLT made of dreams. Layer multi grain bread, crispy bacon, cheddar cheese, fresh tomatoes, avocado (the secret ingredient! ), salt and pepper, lettuce and a smear of Miracle Whip. DE-LISH. I’ve heard people talk about grilled corn, but I never tried it until recently… I was going to grill up chicken breasts and sweet potatoes, and wanted to throw some corn on to boil. It was a hot day, though, so I didn’t want to heat up the kitchen. 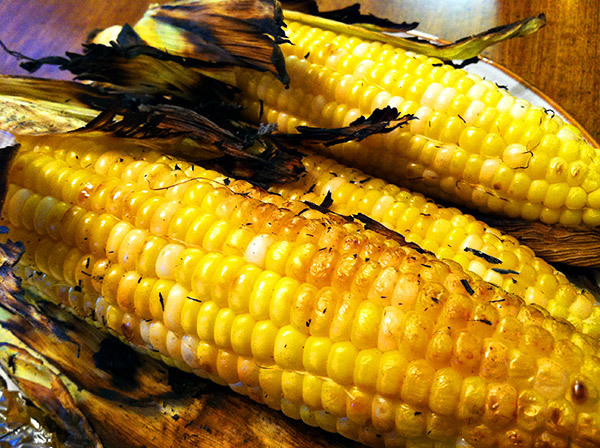 I found an easy guide to grilling corn and now I’m hooked. While cooking, the husks burned off my corn for the most part, which I was a little worried about at first—I kept moving them around and literally blowing out the flames. It was probably a site to see. Ha But I realized the husks burned off quickly so there wasn’t too much flame-age, and I finally just let it go. The end result was such a delicious, smoky flavor in the sweet corn. You have to try it! Mmm. My wine of choice over the last couple years, this sweet Chateau Ste. 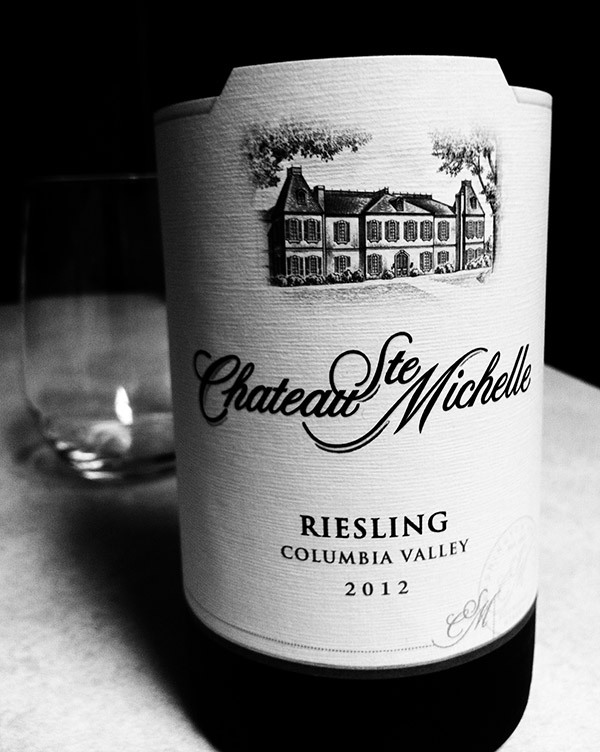 Michelle Riesling. 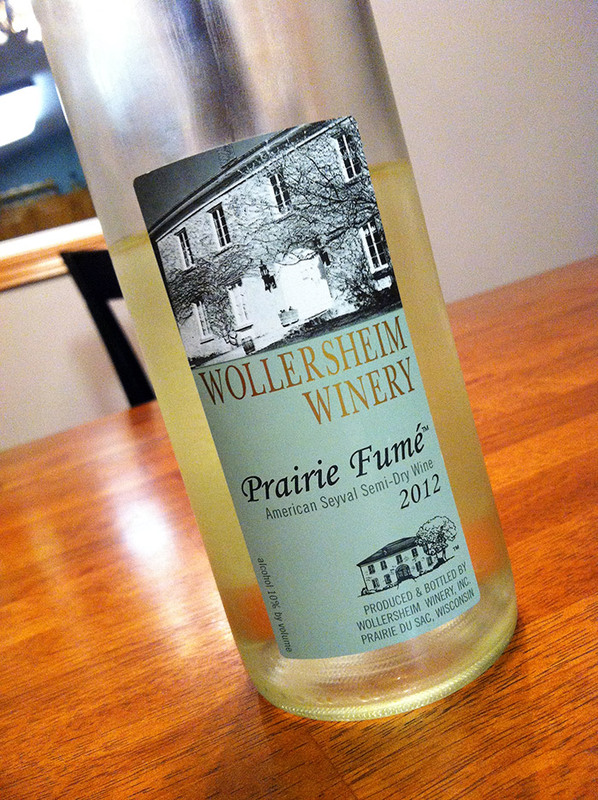 I can never have just one glass of this vino. It’s my go-to! The plus side of fall’s return: Pumpkin beer! 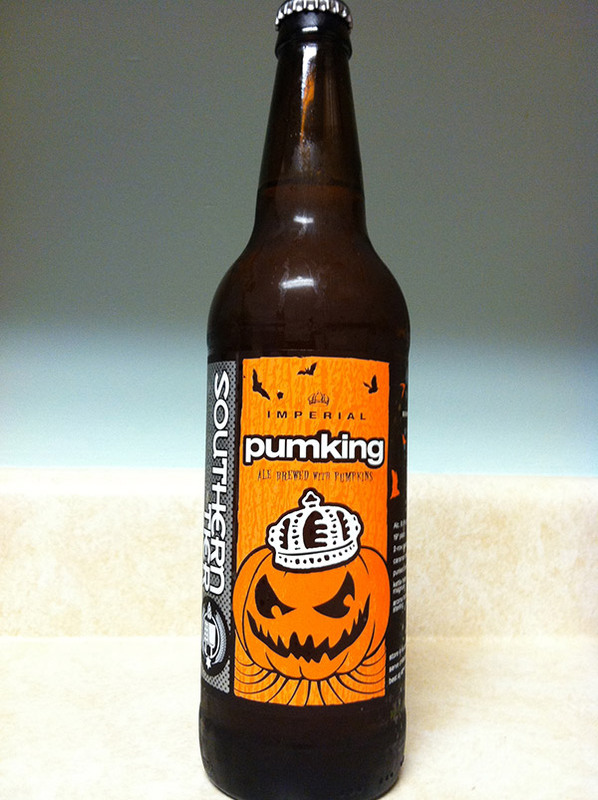 The Southern Tier Pumking beer is truly the King of pumpkin beers in my book. 😉 It’s spicy, has a lot of pumpkin flavor, but it isn’t overpowering. It’s a bit on the strong side (as in after 2 pints, I kinds feel like my head is a pumpkin), but it’s a darker and full-flavored beer, so it’s a good one to savor and sip. Get a load of this brownie. 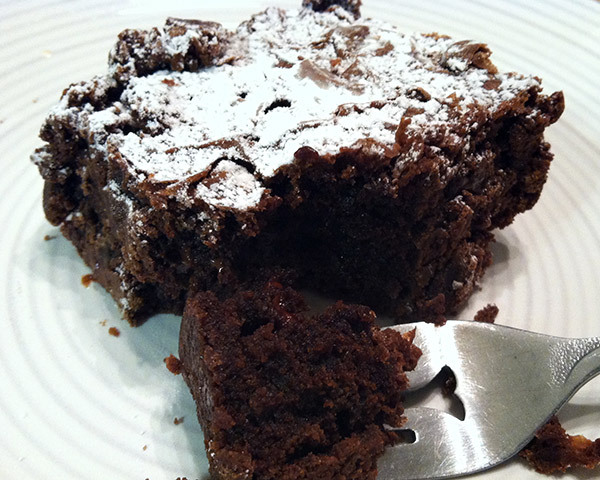 No really, can you get me a truckload of these brownies? The lady at my farmer’s market who makes these is my favorite. Gooey, fudgey, chocolate-y perfection. What are some of your favorite eats (or drinks) lately?? Leave a comment and let me know!